Three CDs with over 2 hours of joyful praise, alleluias and amens! This Wee worship 3 CD collection by Baby Genius is filled with joyful sounds of music for young children. Songs of praise, alleluias and amens will nurture a child's faith and provide a positive, good-news message for daily living. 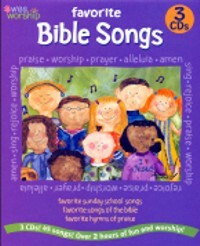 these familiar hymns and new arrangements of favorite Sunday school songs are jam packed with lively fun in this collection of quality christian music.